Curious George Takes a Job was named to the Lewis Carroll Shelf Award list in 1960. Hans Augusto Rey (born Hans Augusto Reyersbach; September 16, 1898 – August 26, 1977) was a German-born American illustrator and author, known best for the Curious George series of children's picture books that he and his wife Margret Rey created from 1939 to 1966. Hans Augusto Reyersbach was born in Hamburg, Germany on September 16, 1898, as was his wife Margret. Hans and Margret were German Jews. The couple first met in Hamburg at Margret's sister's 16th birthday party. They met again in Brazil, where Hans was working as a salesman of bathtubs and Margret had gone to escape the rise of Nazism in Germany. They married in 1935 and moved to Paris, France in August of that year. They lived in Montmartre and fled Paris in June 1940 on self-made bicycles, carrying the Curious George manuscript with them. He died three weeks before his 79th birthday on August 26, 1977 in Cambridge, Massachusetts, United States of America. While in Paris, Hans's animal drawings came to the attention of a French publisher, who commissioned him to write a children's book. The result, Cecily G. and the Nine Monkeys, is little remembered, but one of its characters, an adorably impish monkey named Curious George, was such a success that the couple considered writing a book focused entirely on him. The outbreak of World War II interrupted their work. Being Jews, the Reys decided to flee Paris before the Nazis invaded the city. Hans assembled two bicycles, and they left the city just a few hours before it fell. Among the meager possessions they brought with them was the illustrated manuscript of Curious George. Curious George was an instant success, and the Reys were commissioned to write more adventures of the mischievous monkey and his friend, the Man in the Yellow Hat. They wrote seven stories in all, with Hans mainly doing the illustrations and Margret working mostly on the stories, though they both admitted to sharing the work and cooperating fully in every stage of development. At first, however, covers omitted Margret's name. In later editions, this was changed, and Margret now receives full credit for her role in developing the stories. Curious George Takes a Job was named to the Lewis Carroll Shelf Award list in 1960. The Reys relocated to Cambridge, Massachusetts during 1963, in a house near Harvard Square, and lived there until Hans's death in 1977. In the 1990s, the Reys' friends founded a children's bookstore named Curious George & Friends (formerly Curious George Goes to Wordsworth), which operated in the Square until 2011. A new Curious George themed store opened in April 2012, The World's Only Curious George Store, which now stands in the same location as the original. Traditional diagram of the Gemini constellation. 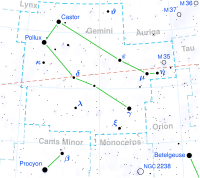 Rey's alternative diagram of Gemini: twins are shown holding hands. Traditional diagram of the Leo constellation. Rey's alternative diagram of Leo: A lion walking. Traditional diagram of the Virgo constellation. Rey's alternative diagram of Virgo: A lying woman. Rey's interest in astronomy began during World War I and led to his desire to redraw constellation diagrams, which he found difficult to remember, so that they were more intuitive. This led to the 1952 publication of The Stars: A New Way to See Them, (ISBN 0-395-24830-2). His constellation diagrams were adopted widely and now appear in many astronomy guides, such as Donald H. Menzel's A Field Guide to the Stars and Planets. As of 2008 The Stars: A New Way to See Them, and a simplified presentation for children called Find the Constellations, are still in print. A new edition of Find the Constellations was released in 2008, updated with modern fonts, the new status of Pluto, and some more current measurements of planetary sizes and orbital radii. The University of Oregon holds H. A. Rey papers dated 1940 to 1961, dominated by correspondence, primarily between Rey and his American and British publishers. The de Grummond Children's Literature Collection in Hattiesburg, Mississippi, holds more than 300 boxes of Rey papers dated 1973 to 2002. Dr. Lena Y. de Grummond, a professor in the field of library science at the University of Southern Mississippi, contacted the Reys in 1966 about USM's new children's literature collection. H. A. and Margret donated a pair of sketches at the time. When Margret Rey died in 1996, her will designated that the entire literary estate of the Reys be donated to the de Grummond Collection. ^ "Monkey Business in a World of Evil". Rothstein, Edward. The New York Times. March 26, 2010. ^ "H(ans) A(ugusto) Rey." Major Authors and Illustrators for Children and Young Adults, 2nd ed., 8 vols. Gale Group, 2002. Retrieved January 2, 2010. ^ a b c d "Guide to the H. A. Rey Papers 1940–1961". Northwest Digital Archives. Retrieved June 24, 2013. With Historical Note. ^ a b Feeney, Mark (September 17, 2005). "A Curious Tale of Georges Creators". The Boston Globe. Retrieved October 29, 2007. ^ Stoddard, Dimitri (May 2, 1980). "About H. A. and Margret Rey". Mifflin Harcourt. Retrieved February 23, 2015. ^ "New York Times, By Dinitia Smith". The New York Times. September 13, 2005. Retrieved October 29, 2007. ^ "Rey". Sousa Mendes Foundation. Archived from the original on November 2, 2013. Retrieved January 19, 2014. ^ H. A. Rey (1998). The Original Curious George (Collector's ed.). HMH Books. ISBN 978-0-395-92272-9. OCLC 39972712. ^ "Boston.com Culture Desk, By Doug Most". The Boston Globe. June 6, 2011. Retrieved March 29, 2012. ^ Rao, Joe. "Four-Star Sight: The Celestial Diamond". Space.com. TechMedia Network. Retrieved January 19, 2014. ^ French, Jeffrey A. (February 1, 2009). "Grades 5 & Up: REY, H. A. Find the Constellations". School Library Journal. Archived from the original on July 11, 2009. Retrieved January 19, 2014. ^ "H. A. Rey & Margret Rey Papers" Archived July 5, 2013, at the Wayback Machine. de Grummond Children's Literature Collection. University of Southern Mississippi. June 2001. Retrieved June 24, 2013. With Biographical Sketch. New York Times: "How Curious George Escaped the Nazis"
Curious George Saves the Day: The Art of Margret and H. A. Rey, The Jewish Museum (New York), March 14, 2010 – August 1, 2010. This page was last edited on 24 March 2019, at 18:03 (UTC).